Something new and exiting at Clayborne’s - It’s our solid oak curio cabinet. Made to the exacting standards of Amish craftsmen, it features four glass shelves with plate grooves in the back, a mirrored back, can light to illuminate your treasures, and a mirrored back. It also features raised panel doors, decorative moulding at the top that matches some our our entertainment centers and decorative bookshelves, and a large storage area in the bottom. It is difficult to tell from the picture, but the cabinet is the shape of a half-octagon (half a stop sign). There is a single door on the front for the display area, and another for the bottom storage area. As an option, you can request your curio cabinet with a cut-glass v-groove in all the viewing glass, and of course we will finish it to your specifications. 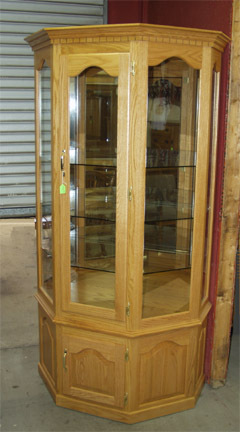 Amish solid oak curio cabinet with glass shelves and light.